In normal cells, the HSP70 ATPase cycle performs several fundamental functions: (1) together with co-chaperones, HSP70 forms a protein folding mechanism and provides protein transportation into organelles; (2) assisted by HSP40, HSP70 recognizes irreversibly damaged proteins and, assisted by CHIP, Bag-1 and HSJ1 ubiquitinates these proteins, thereby targeting them for degradation via proteasomes; and (3) together with the co-chaperones HSP90, HSP40, Hip, Hop and Bag-1, HSP70 recognizes normal proteins containing the marker sequence KFPRQ and sends these proteins for degradation in lysosomes. Thus, the HSP70 ATPase cycle forms a protein quality control system or the FOlding Refolding Degradation machinery (FORD) and, depending on the state of the protein, sends the protein either for re-folding or for degradation. Because of the FORD machinery, a cell maintains protein homeostasis. 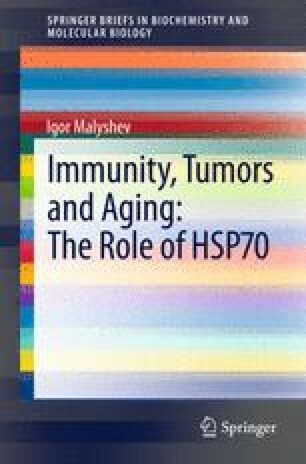 The HSP70 ATPase cycle also controls the activity of key signalling proteins by maintaining these proteins in an inactive or active state by regulating their levels and by intracellular transport.